Expectorant mean of herbal origin. Generic name: Althaea syrup – Althea medical extract. Pharmacological group: Expectorant mean of herbal origin. Plants compounding in preparation contain complex of biologically active substances: mucus (pentosans and hexosans), essential oil, flavonoids, anthocyanins, organic acids (lemon, apple, salicyl), pectic materials, C, B group vitamins, carotin, starch. 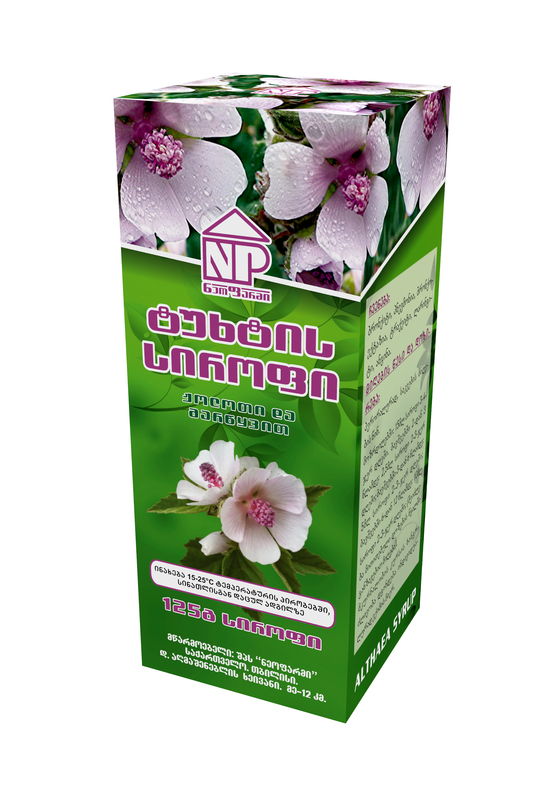 Pharmacological operation: Althaea syrup calms coughing, covers damaged mucous integument with wispy layer, softens and dissolutes - solid, inflammatory scurf (throat, larynx, sound yogins); hastens regeneration of the damaged mucous integument; protects respiratory tract nerve endings from irritation, improves appetite and lessens thirst feeling. In case of occurrence side-effects, the patient should cancel reception of the preparation and consult with a doctor. At occurrence of such symptoms which are not mentioned in using instruction, the patient should consult the doctor оr the pharmaceutist. Using rule and dosage: Preparation is taken perorally, before eating. For juveniles: 15 ml syrup 3-4 times a day. For сhildren from 2 to 3 years: 2.5 ml syrup 2-3 times a day. For сhildren from 3 to 6 years: 5 ml syrup 2-3 times a day. For сhildren from 6 to 12 years: 10 ml syrup 2-3 times a day (Indicated dose may be diluted in water). In case of dose omission is not recommended to take double dose of the preparation. The next dose should be taken as soon as possible or accoding to the initial scheme. Usage in pediatrics: The preparation is not prescribed for children till one year of age. · Because of strawberry aromatizer in syrup, there may be individually revealed allergic rash with hard itch. Pregnancy and the period of a lactation: Preparation can be used during pregnancy and lactation by the doctor’s prescription. Interaction with other preparations: Reception of the preparation is not recommended with other cough suppressant and Codeine containing preparations. Caution: The Preparation is carefully prescribed for patients with diabetes, in the period of pregnancy and lactations. Special indication: The preparation is not prescribed for children till one year of age. Overdose: Cases of overdose are not fixed. Primary packing: 125 gram suryp in orange glass or polymeric material bottle. Secondary packing: The bottle is placed in a carton box with instructions. Storage conditions: store on 15-25º C, in protected from ligtht place. Issue: III group of a pharmaceutical product - issued without prescription.